Though it is winter outside, it is spring in our greenhouses! Are you itching to get your hands dirty as you peruse seed catalogs this winter and dream of warmer days? Volunteering with Crabtree’s greenhouse team might be just the thing to satisfy your urge to get the 2019 growing season into action. 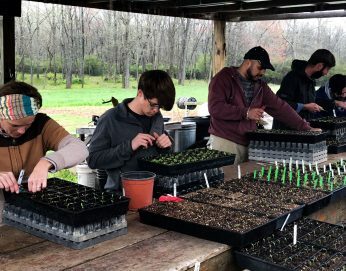 While our planting dates are months away, this is the time of year for the greenhouse team to recruit folks to help sow the seeds that will eventually end up in Crabtree’s fields or the hands of folks who take advantage of our annual April Spring Plant Sale & Festival. As Mike Barron, our Farm Operations Manager, reminds us, “It’s winter outside, but spring in the greenhouses.” Come stay toasty with us as Mike, Andy, and their team of greenhouse volunteers help you learn the skills needed to grow both annuals and perennials. We’ll be starting peppers, tomatoes, and herbs from seed and splitting (propagating) perennials to multiply the number of plants that we can offer at our upcoming spring sale. You can gain a great deal of knowledge by volunteering with the greenhouse folks–making it a fantastic way for both beginner and expert gardeners alike to hone skills and get growing tips to use in home gardens. We’d love to have you join us as a volunteer! To do so, please email Melissa Astin at [email protected].